We are in Wisconsin now, got a good night's sleep, and have spent the day tooling around town. 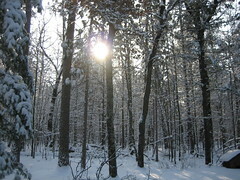 All of the pine trees are covered in snow and the other trees that have bare branches that are covered in ice. 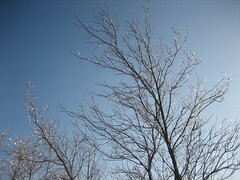 It's really beautiful even though it's very cold, we seem to have quickly forgotten this. Here are a few pictures of our day today and you can click on them to see more if you like. Morning at my parents'. This is the edge of their yard and you can see they like all the trees. This photo doesn't capture the glow of these trees in the December sun. 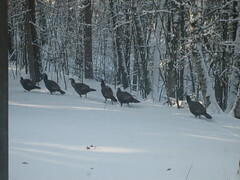 This is the turkey trot taken through the living room window looking at the backyard. 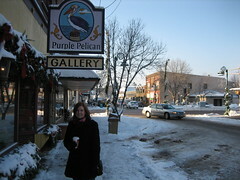 Shopping at the art gallery downtown Spooner!